Final Grand Trunk eLearning campaign inside the Experticity mobile app. 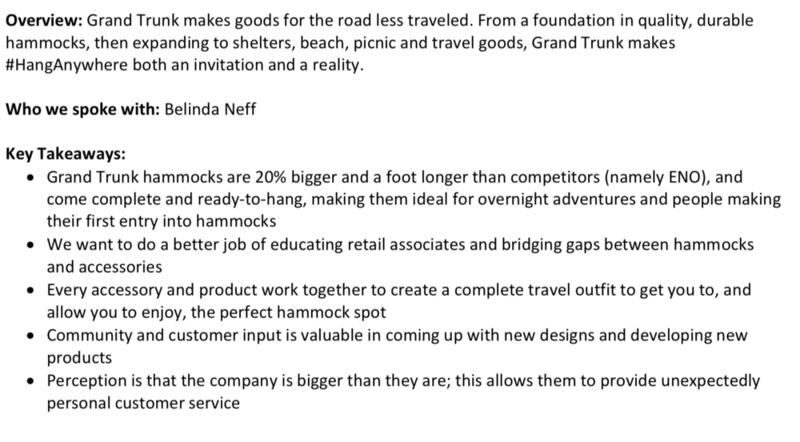 The goal of Grand Trunk's eLearning campaign was to create brand awareness for Grand Trunk on the Experticity platform and cover a broad range of their outdoor hammock products in a 5-minute lesson. Our biggest challenge was to be able to summarize brand information, expert content, and the product range within a 5-minute time scope. Set up a client kickoff with the brand. Assess what Grand Trunk's business goals are for their eLearning campaign and what sort of engagement they want to get from our users. Brand awareness? Product seeding? What is Grand Trunk's brand perception? What do people love or hate about their Grand Trunk hammocks? How do Grand Trunk's hammocks compare to their competitors, generic (R.E.I. brand) or otherwise? Is there a common thread of questions that their customers have about the product can be answered by the brand? Brainstorm—Taking into consideration Grand Trunk's business goals (brand awareness & product information) as well as the market research/brand perception information we've gathered, brainstorm a storyline presentation alongside the Instructional Designer that balances the brand's business goals with authentic feedback from their customers. What type of person would benefit from Grand Trunk hammocks/gear? Are there any vetted experts that we can interview who can give us an honest opinion on the brand? Information Architecture—how will the story flow throughout the eLearning module? Will we interview a vetted expert or dive into the brand's product line? Before we begin brainstorming, we set up an initial kickoff client to find out what their business goals are for this eLearning campaign. What information is important in making Grand Trunk's eLearning campaign successful? Customer perception is that the company is bigger than they are; this allows them to provide unexpectedly personal customer service. All Grand Trunk products work together to create a complete travel outfit. Now that we have a clear idea of how the story should flow based on our flow map which we created in our brainstorm, we can flesh our storyline presentation for the client which will be a outline of the eLearning campaign. We plan to give Grand Trunk gear to one of our vetted experts to try out on an adventurous weekend in the mountains. Now that I have an idea of what I need to make structurally and visually, I can begin to make the final high-fidelity design and code the prototype. I choose a color theme based on what I think will give the campaign a very clean, modern feel and is line with the Grand Trunk's brand guidelines and lifestyle imagery (in this case white, red, and black) and begin to make my graphics. From there, I export all of my images and lay out the structure of the campaign as slides in HTML/CSS/JS and input my graphics. Once this is done, the finished module is run through a QA team which includes myself, and it is tested for mobile, app, and desktop compatibility as well as any content that needs to be adjusted. Once that is done, we present the final prototype to Grand Trunk in a site presentation meeting and receive any edits and feedback from them. Now that our prototype is completely designed and coded, we present the module to the client, reiterate our engagement goals that we discussed during the storyline presentation, and collect any feedback the client may have on the design and/or content. Positive. Client was happy with final design and the interview layout that we chose. We had a few image swaps and had to add more detailed product information, which in the end made the module slightly longer than five minutes. Our biggest challenge was balancing what we knew our best user experience practices were (keeping content to five minutes and not overloading the user with too much information) while also keeping the client happy and adding more information about their product line. While the Instructional Designer and I both felt the campaign was successful, we were unhappy with the amount of content we needed to include because it pushed us over the 5-minute threshold for the campaign. Based on our user experience data and best learning practices we know that most people can only retain three pieces of information at a time, so adding tons of extra information might overload the person taking the campaign and they may not retain the extra product information. However, we were very happy with our expert interview, and how well it was woven into the lesson. It gave Grand Trunk's campaign a more authentic feel and more importantly focused on our users, experts, which is the ultimate goal that we strive for.